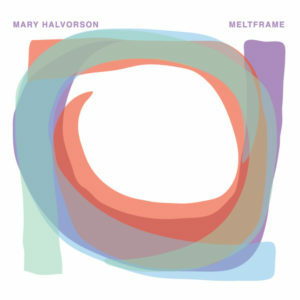 Mary Halvorson is one of the most talented guitarists of her generation. Her approach might be compared to that of Bill Frisell. Both guitarists have eclectic interests, a generous spirit towards collaborations, penchants for odd — almost contrarian — improvisations, and a willingness to employ distortion. However, especially in his later years Frisell has gravitated toward a pastoral Americana in his work that can come across as sedate and complacent. Halvorson, on the other hand, is much more willing to dabble in dissonance and incongruous leaps. That is to say, Halvorson sounds like Frisell turned up to eleven, with a more adventurous sense of composition. Meltframe is a collection of solo guitar cover versions of generally lesser-known jazz tunes. For the most part, this is yet another tremendous album from Halvorson. She opens the set with a ragged, willfully jagged and loud take on Oliver Nelson‘s “Cascades.” Then there is “Cheshire Hotel” by the French guitarist Noël Akchoté, a sometimes collaborator with Halvorson, with a sort of pop derived melody and an emphasis on rhythmic reverb. Duke Ellington‘s “[(In My)] Solitude,” probably the most widely known composition to appear here, is played with a solemn yet sensitive emotional palette — another of the disc’s highlights. Carla Bley‘s “Ida Lupino” gets an acoustic treatment, recasting the tune’s tender, nostalgic sympathies for a charismatic female actor/director fading from view by newly emphasizing a kind of scrappiness. The album does drop off toward the end, with compositions that impress much less and performances that only occasionally spark interest. So the album is a tad uneven, but most of what is here is good-to-great.